For the almost four years I’ve been writing blog, I’ve periodically shared my concerns about developing national standards. I’ve feared that people were over-estimating its impact on the classroom (where, in fact, I think it’s more like callers to talk radio feeling like they’re actually doing something about a problem). And I’ve been concerned that it was a boondoggle for publishers and testing services salivating at the prospect of selling new textbooks and tests. But the Common Core Standards train has long left the station, and that fight is lost. However, we can still try to minimize its negative impact. To that end, I thought I’d bring together a few resources that I’ve found helpful in gaining an understanding of what Common Core might mean. Please feel free to additional suggestions. Testing the Common Core Standards, also by Valerie Strauss. She has also written The problem(s) with the Common Core standards. 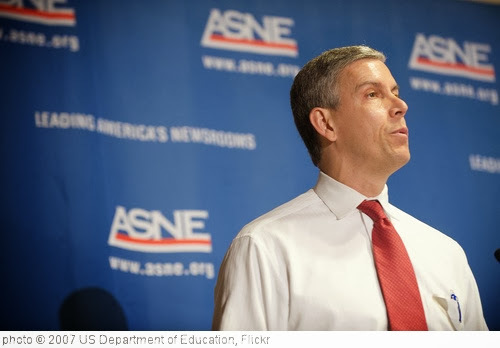 The Common Core: Policy Triumph or Commercial Bonanza? by Nancy Flanagan at Ed Week. Will National Standards Improve Education? is a useful New York Times forum. Common Core Standards: Hardly an Evidence-based Policy by Larry Cuban. National Standards a Wild Goose Chase by Anthony Cody at Ed Week. David Cohen has a very thoughtful post titled Common Core Confusion. Be sure to read the comments, too. Common Core Confusion – ASCD Edition is by David B. Cohen. Jeffrey N. Golub: Common Core Standards Leave Teachers Out of the Equation is from Ed Week. Good riddance to new national standards is by Jay Mathews at The Washington Post. Choking on the Common Core Standards is by Joanne Yatvin and appeared in The Washington Post. Common Core won’t likely boost student achievement, analysis says is from Valerie Strauss at The Washington Post. Common Core: David Coleman is no Doug Lemov… is by Alice Mercer. Why Common Core Standards Will Fail is by Larry Cuban. Standardization: From Carnegie Units to Common Core Standards is a guest post at Larry Cuban’s blog. Why Common Core standards will fail is by Jay Mathews at The Washington Post. Teacher: One (maddening) day working with the Common Core is from The Washington Post. Does the Common Core Matter? appeared in Education Week. The Common Core: The Technocrats Re-engineer Learning is by Anthony Cody. Common Core standards drive wedge in education circles is from USA . Yong Zhao Interview: Will the Common Core Create World-Class Learners? appeared in Anthony Cody’s blog at Education Week. Common Sense Vs. Common Core: How to Minimize the Damages of the Common Core is by Yong Zhao. My View of the Common Core Standards is by Diane Ravitch. Common Core vs. Common Sense appeared in Education Week. Five Questions to Ask about the Common Core is by Yong Zhao (and here’s a follow-up by him). A tough critique of Common Core on early childhood education is from The Washington Post. Speaking Back to the Common Core is by Thomas Newkirk. Common Core: Will it hurt struggling readers? is by Laura Robb. Common Core supporter: ‘I see the opportunity being squandered’ is by Stephen Lazar. The Common Core’s Fundamental Trouble is from Rethinking Schools. Why Common Core Standards Will Succeed is an ironic title of a Larry Cuban post. Linda Darling-Hammond on the Common Core Standards appeared in Diane Ravitch’s blog. Federal Bureaucrats Declare ‘Hunger Games’ More Complex Than ‘The Grapes of Wrath’ The Common Core’s absurd new reading guidelines is from The New Republic. The WOW! factor of CCSS is by Alice Mercer. Following Common Core money: Where are millions of dollars going? is by Carol Burris and appeared in The Washington Post. The Common Core Kool-Aid is from Rick Hess. Common Core and the Food Pyramid is also by Rick Hess. When, How and With Whom to Battle the Common Core? is by Nancy Flanagan. Everything you need to know about Common Core is by Diane Ravitch. Why Common Core Advocates Should Let Teachers Lead It is by Jeff Bryant. A challenge: Teach 8th grade Common Core before endorsing it is from The Washington Post. The coming Common Core meltdown is by Stan Karp. Teachers union head calls for Core ‘course correction’ is from The Washington Post. How Common Core Could Double Dropout Rate is by John Thompson. Will Common Core double the high school dropout rate? is from The Washington Post. In it, Valerie Strauss picks-up and elaborates on my previous post, McKinsey & Company Projects That Common Core Implementation Will Result In 15% Increase In Dropout Rate. Common Core’s five big half-truths is by Frederick Hess. Common Core: yes or no? A debate. appeared in The Washington Post. Common Core calls for kids to read books that ‘frustrate’ them. Is that a good idea? appeared in The Washington Post. Teachers grade Common Core: C+ and room for improvement is from The Christian Science Monitor. How to start cleaning up the Common Core is by Carol Burris. The Two Biggest Mistakes in the Common Core Standards is by Grant Wiggins. How Twitter is changing the national Common Core debate is an intriguing article about an interesting project. Superintendents, but not teachers, give high grades to Common Core rollout is from Ed Source. Common Core, College Readiness Skills Don’t Match Up, Study Says is from Ed Week. The key is whose standards are we adopting, but as a teacher, what got me on board with these was the fact that in Texas where the standards are easy to master, students consistently score proficient and meet their NCLB goals, but in a state like California where the standards are much more rigorous, our students, parents and teachers are constantly being told were failures for not showing progree, even when we are working with the same populations. It then becomes an issue of equity. Moving to national standards is also shifting the debate on what to do about testing. Already there are many teachers like myself who are salivating for new, more authentic and on-going assessments that are tech based, and move at the students own pace of mastery. I think there is great potential here. Larry, if implemented effectively, the Common Core State Standards will help our students be more prepared for the 21st century workplace. We need to restructure our current out-dated curriculum, and move away from just focusing on content and activities, and move to a system where we focus our curriculum first on skills, and create common assessments that measure proficiency of these skills. We have revamped our curriculum in 5 classes this year and in the process of revamping more. It has revitalized our curriculum and rejuvenated our teachers. Hi Larry, It would be helpful to identify that the second post you cite, Testing the Common Core Standards, is not actually by Valerie Strauss–it’s a guest post on her blog by Todd S. Farley, who worked for years in the standardized testing industry. I see two keys to implementation: 1) Use the adoption of Common Core to end standardized testing and instead re-empower teachers to use formative assessment to guide 2) truly differentiated instruction, where each student (not just “special ed” students) has an Individualized Educational Plan and begins to take charge of their own learning. This is the major implication of adopting the Common Core: all education becomes digitally driven and empowered, so that access is universal and equity results.